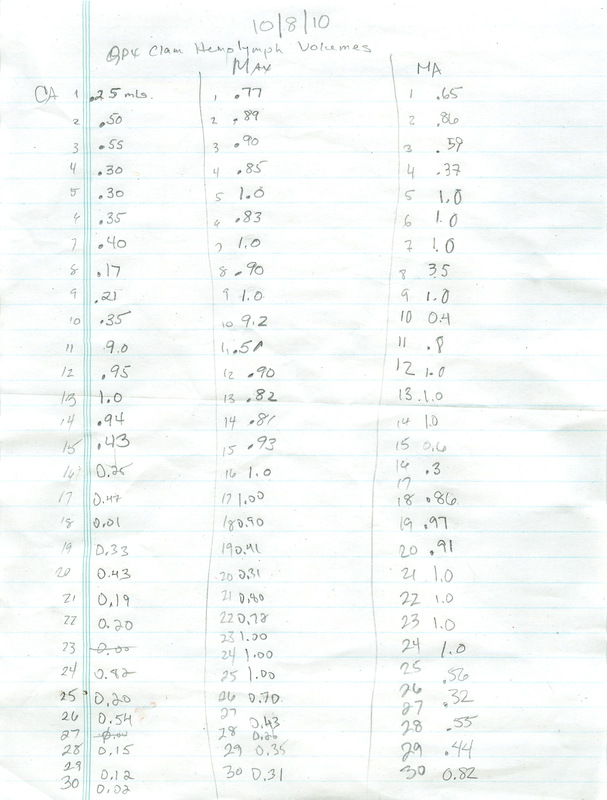 Ran a qPCR to evaluate a large batch of primers (40 sets) that were ordered per Steven, based off of the most recent SOLiD run (samples submitted 3/10/2011; see Dave’s notebook for more info). Pooled cDNA (2uL from each individual; from 20110511) was used. Master mix calcs are here. Plate layout, cycling params, etc. can be found in the qPCR Report (see Results). The list of primers tested is available in the Primer Database and consist of SR IDs 1233 – 1312. For brevity, samples were only labelled with the corresponding contig number. Samples that produced good melt curves are listed here. 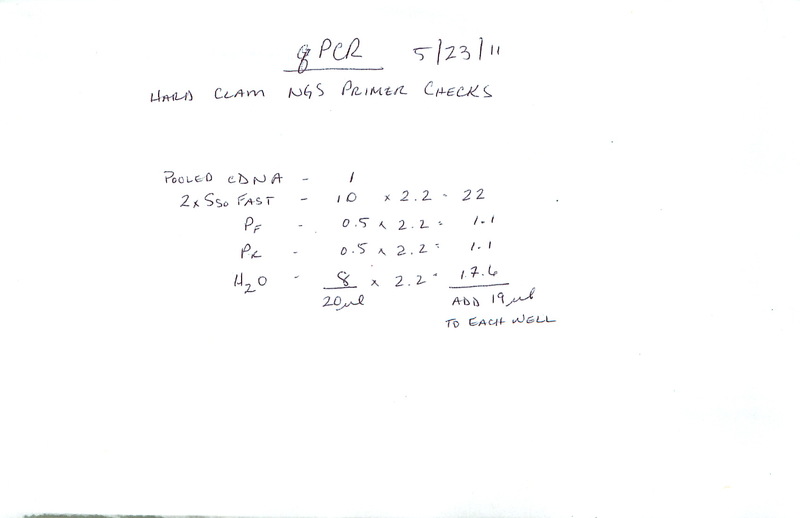 This entry was posted in Miscellaneous and tagged cDNA, CFX96, Hard clam, Mercenaria mercenaria, qPCR on 23 May, 2011 by kubu4. 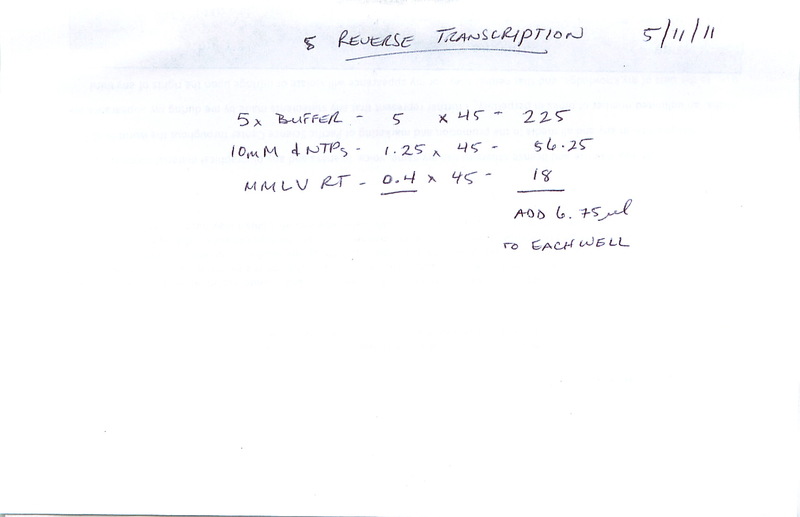 Performed reverse transcription on DNased RNA from the hard clam vibrio tubiashii challenge experiment (see Dave’s Notebook 5/2/2011), following the Promega M-MLV RT protocol with ~1ug of DNAsed RNA. Master mix calcs are here. Reactions were done in a plate. cDNA was diluted 1:4 with H2O. This entry was posted in Miscellaneous and tagged cDNA, DNased RNA, Hard clam, M-MLV, Mercenaria mercenaria, reverse transcription on 11 May, 2011 by kubu4. DNased 5ug of RNA from each sample with Ambion’s Turbo DNA-free Kit, according to the manufacturer’s rigorous protocol. Samples were spec’d and stored @ -80C in the “Hard Clam V.t. Experiment RNA” box. Due to lack of a positive control (and lack of primers known to amplify gDNA), these DNased RNA samples will NOT be checked to verify elimination of gDNA carryover at this time. Will proceed with making cDNA for qPCR anyway. This entry was posted in Miscellaneous and tagged DNase, DNased RNA, Hard clam, Mercenaria mercenaria, NanoDrop1000, RNA, RNA quantification, Turbo DNA-free on 9 May, 2011 by kubu4. Isolated RNA in 1mL of Tri-Reagent according to the manufacturer’s protocol. Also, finished RNA isolation of samples that were started 20110506. Samples were resuspended in 50uL 0.1%DEPC-H2O and spec’d. This entry was posted in Miscellaneous and tagged Hard clam, Mercenaria mercenaria, NanoDrop1000, RNA, RNA isolation, RNA quantification, TriReagent, Vibrio tubiashii on 9 May, 2011 by kubu4. 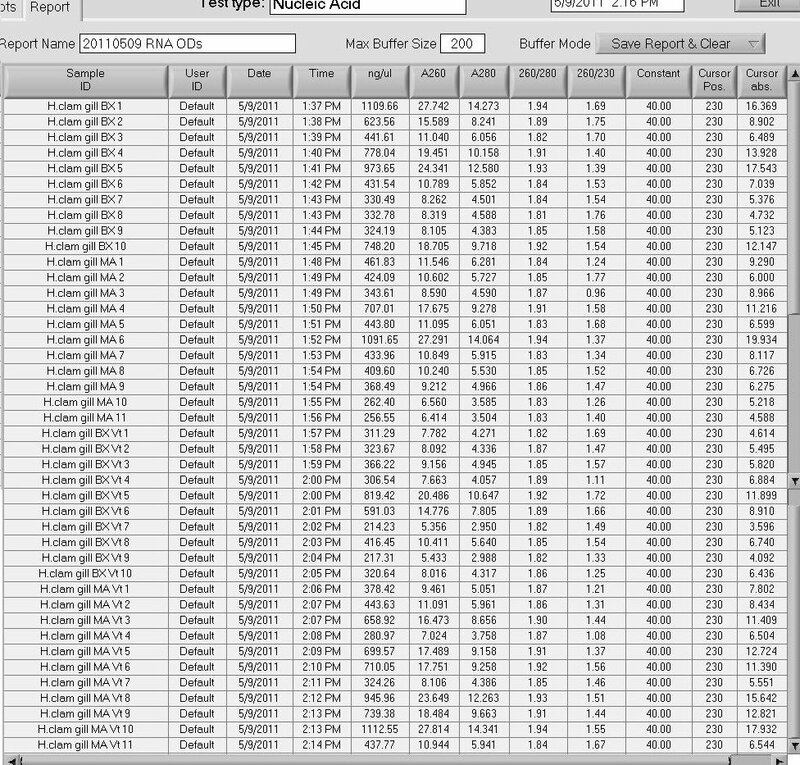 Designed primers for 40 PCR targets derived from the most recent SOLiD data by Steven(Evernote link) using BatchPrimer3. BatchPrimer3 results are here. 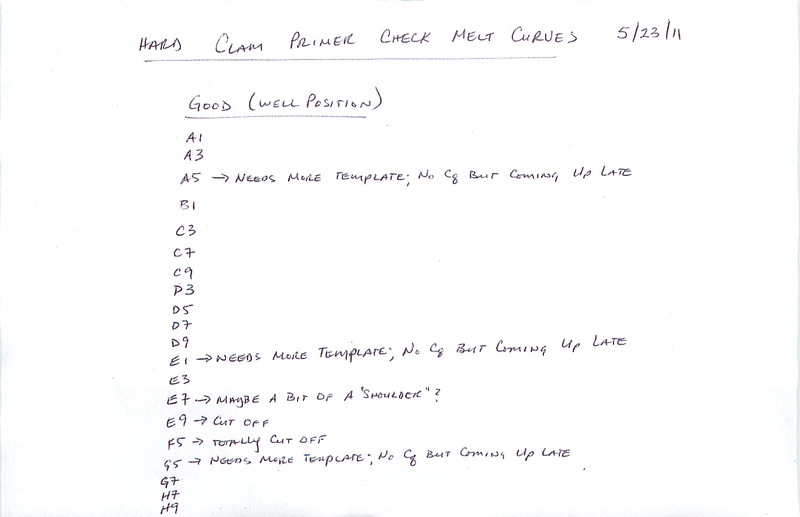 This entry was posted in Miscellaneous and tagged Hard clam, Mercenaria mercenaria, primers on 8 May, 2011 by kubu4. This entry was posted in Miscellaneous and tagged gill, Hard clam, Mercenaria mercenaria, RNA isolation, TriReagent, Vibrio tubiashii on 6 May, 2011 by kubu4. Received two bags containing ~24 live clams (didn’t count) in each bag. One bag labeled as “Mashpee Control” and the other “BX Selected.” Clams were stored @ 4C by Steven. This entry was posted in Miscellaneous and tagged BX selected, Hard clam, Mashpee, Mercenaria mercenaria on 28 April, 2011 by kubu4. 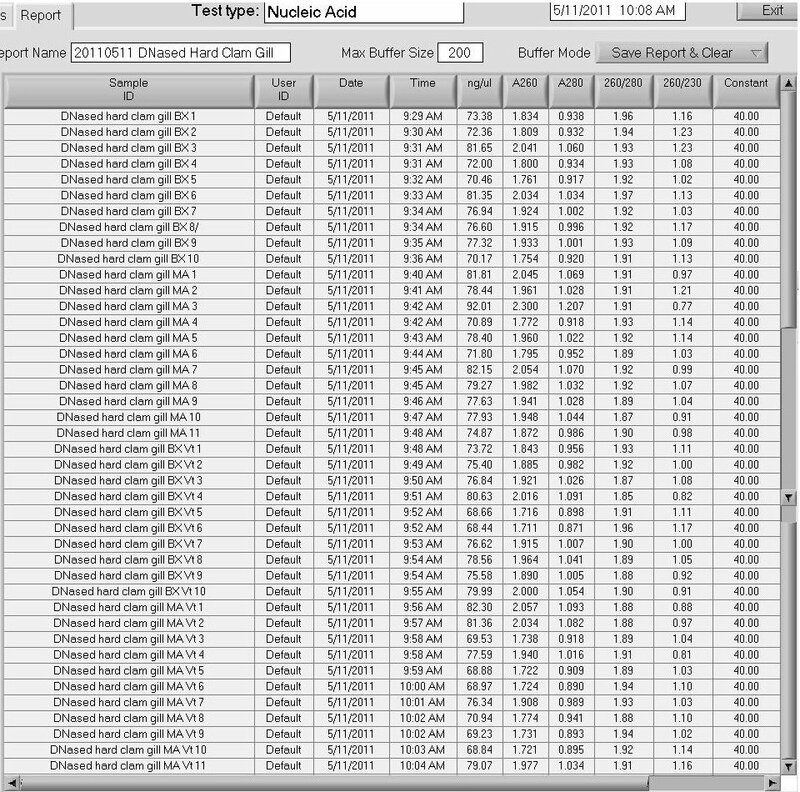 30 gill tissue samples in RNA Later from CA, MA, & MAX each. 30 hemolymph samples (in RNA Later?) from CA, MA, & MAX each. Presumably these are from the same individuals. Tubes were boxed (a total of 3 boxes), labeled and stored @ -80C. Here is a note included from Emily with the samples . This entry was posted in Miscellaneous and tagged CA, gill, Hard clam, hemolymph, MA, MAX, Mercenaria mercenaria, Rutgers on 15 October, 2010 by kubu4.